Passing through the large gates and along the drive through the vast estate, there was a palpable sense of excitement in the car. We drew up to the imposing honey-coloured building, which we had only just glimpsed through the trees, hearing a satisfying sound of tyre on gravel as we turned and parked. “It’s Downton Abbey!” I gasped. “Do you think Carson will come out to greet us?” Dougie replied. “It’s huge!” muttered Rory from the back seat, having only just unplugged himself from his iPod and joined the land of the living. Carson wasn’t there to meet us but Robert certainly was, with a welcoming smile and a hearty handshake. With little fuss we were handed an envelope containing all the important information we needed and two proper keys attached to a large leather fob with the word ‘Hillieri’ engraved on the side. We had arrived at the Ickworth Hotel, the East Wing of Ickworth House, a National Trust property just outside Bury St Edmunds in Suffolk. A neo-classical country house, Ickworth was the home of the Hervey family from 1702 to 1996 and stands in 1800 acres of parkland just waiting to be explored. We weren’t the only family set to enjoy a weekend in such sumptuous surroundings. The Ickworth Hotel is part of the Luxury Family Hotels group, which offers affordable family breaks to some of England’s finest country house hotels. Everything a parent might want to find in a hotel, this group have already provided…and then some. 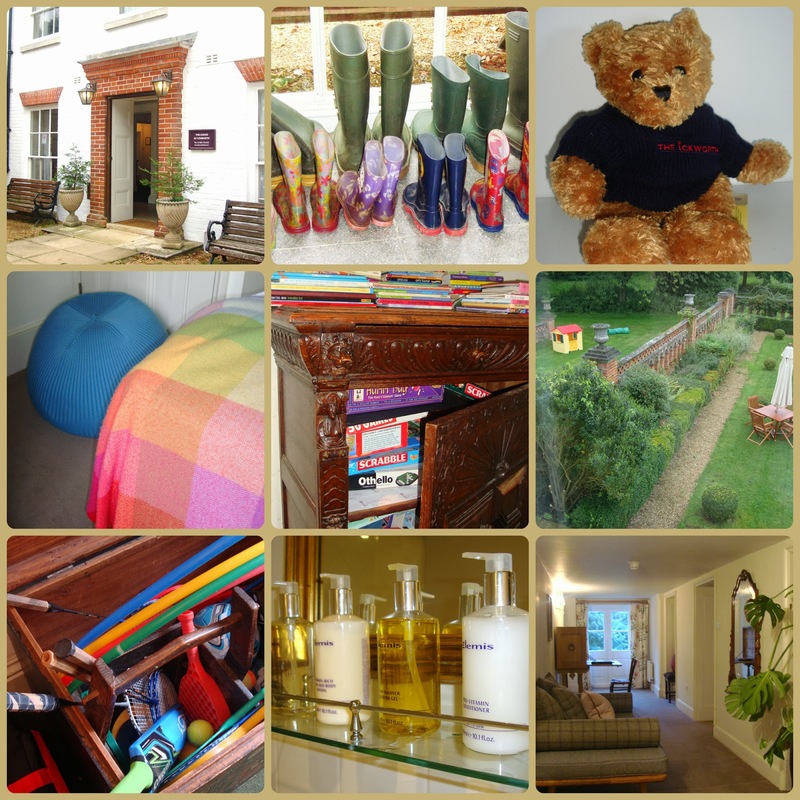 At Ickworth, families have access to a creche (complimentary 2 hour stay each day in the Four Bears Den), an adventure playground, cinema, swimming pool, bikes, DVDs and cupboards full of games. Baby in tow? No problem. Changing mats, bottle warmers, sterilisers and all the paraphernalia you would normally expect to bring with you is available, even a Bugaboo for those long country walks. Older children? Let them loose in Club Blu, their own room with PlayStation, Wii, air hockey, table tennis and table football. Adults aren’t forgotten in this vast children’s playground. While the kids are being entertained in the den or the club, on the same corridor is The Spa where you can relax with a massage or facial, confident that you’re in expert hands. Mind you, even in the spa they haven’t forgotten the younger generation. There are special facials for teenagers and even a 20 minute nail treatment for girls. Accommodation in the hotel is either in the main house, where connecting rooms are available, or in an apartment in The Lodge, a separate building which is a 10 minute walk or short bike ride away in the grounds. Our apartment in The Lodge consisted of a long hall with writing table and sofa, leading to a large room with double bed and seating area at one end and kitchen facilities with a dining table at the other. Rory had his own room off ours and we all shared the bathroom. The apartments differ in size but all are traditionally furnished. 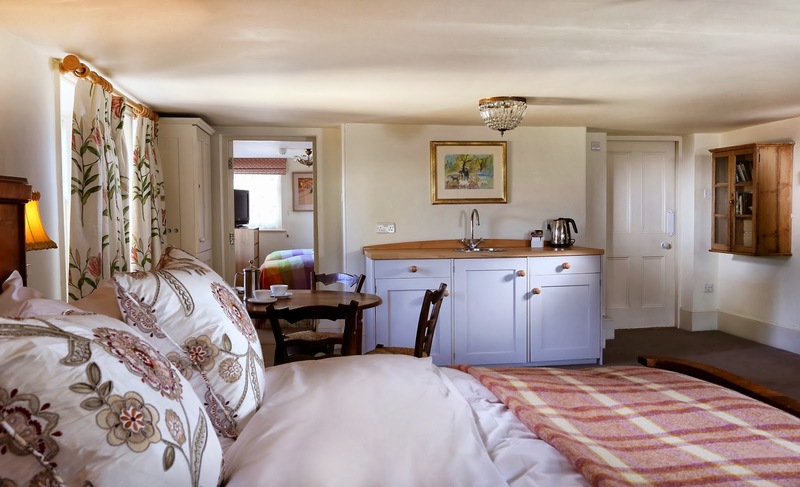 Having recently been given a make-over, the rooms have retained the well-loved furniture but have been freshened up with new carpets and upholstery. Hillieri, where we stayed, is probably not the most appropriate if you have anyone around 6′ tall in your group as the light fittings hang low and you’ll need thighs of steel to hunker down under the shower. That aside, it was a pretty, charming room and we felt as if we were staying in someone’s beautiful country home, which, I suppose, when you realise The Lodge was home to the 1st Earl of Bristol and subsequent family members, we were. Families staying in The Lodge have their own breakfast room at weekends and school holidays: a delightfully sunny place with scrubbed wooden tables and comfy sofas in front of a large fireplace. Hot and cold buffet breakfast is provided and parents have access to high chairs, bibs, sippy cups and brightly coloured plates for their little ones. Lunch and dinner is taken in the main hotel. 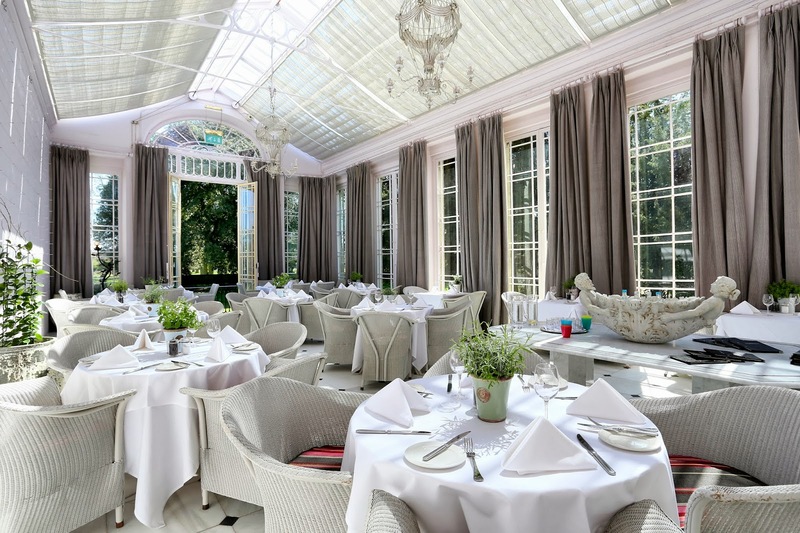 Family dining in the wonderfully light Conservatory is served from 12 noon to 7.30 in the evening (although this seemed to be extended to allow later diners when we were there). The food choices are simple and portions are large: battered haddock and chips, pasta, curry and steaks. The children’s menu included fish, chicken and pasta. Service was attentive yet relaxed and friendly. Fancy a more adult affair, to get some time away from the children? Arrange for a babysitter or use the Baby Listening Service if you have a room in the main hotel to take advantage of fine dining in Frederick’s. Over 16s only allowed in this restaurant so our 17 year old was allowed to accompany us. We ordered our drinks from the comfort of the Drawing Room, sinking into large comfortable sofas then making a bee-line, once they were free, for the two original leather Eames chairs by the window. Frederick’s restaurant consisted of two smart, comfortable rooms and the food was beautifully presented. The highlights for me were the starters (try the Seared Cromer Scallops with tempura cauliflower, apple and caviar) and the puds (a heavenly Hot Chocolate Fondant with pistachio ice cream and praline dust). What makes a stay at The Ickworth different from other UK breaks we have experienced, is the feeling that you are a world away from real life. Knowing that children aren’t just tolerated but are positively welcomed makes a huge difference to any parent, allowing them to truly relax and enjoy the experience. With bikes to hire, numerous walks to choose from and free access to the National Trust property on site, there isn’t any need to leave the confines of the estate if you want to pretend that you’re the Crawleys for a few days. On our second evening, as we were walking from The Lodge to the main hotel, Dougie decided to nip back to the room to fetch a jacket. Rory and I continued to amble along when suddenly we spotted a herd of deer running across the park. The light was dim and there was a mist adding a thin veil over the scene. We stopped walking, held our breath and our eyes followed the graceful young animals as they galloped across the road in front of us and disappeared into the woods. A minute or so later Dougie caught up with us. “You missed the deer,” Rory said to his dad. “Deer? What deer?” Dougie replied. Good food, space to play, free WiFi, attentive yet informal service from cheerful staff and a herd of deer to entertain you. The Ickworth ticks many boxes and is well worth considering if you fancy a 21st century Downton experience. Bottom Row: Chest full of toys, Bathroom toiletries, Hallway in Hillieri apartment. We stayed at The Ickworth Hotel as guests of Luxury Family Hotels. One of the current special offers, running until 19 December 2013 (excluding October half-term and Friday/Saturday nights) – two nights from £249 per room for two nights B&B, including a three course dinner on one night. Children under 16 stay for free in parents’ room. The offer is available in seven of the Luxury Family Hotel properties, excluding Thornbury Castle. For further details of all hotels in the group visit www.luxuryfamilyhotels.co.uk. You can also find them on Facebook (www.facebook.com/luxuryfamilyhotels) and Twitter @LFHotels to receive news of special offers. The first photo and the final montage are my own. All others are courtesy of Luxury Family Hotels. I say old bean, looks just the place to put on the old razzle-dazzle! Yup, very close to my brother's house, looked at staying there once then I realised I could stay there for a few days or pay off the mortgage. Well ok slight exageration but that sort of luxury with wee bairns isn't coming in cheap! looks jolly lovely though. It's not cheap, I know. Mind you, when I look at the prices we often pay to have two rooms in a hotel for the three of us, this large apartment at Ickworth was quite competitive. But I realise many of the hotels we go to aren't exactly budget choices! I had to keep telling myself that people aren't just paying for a room – they are paying for a room in a National Trust property with excellent facilities. Worth keeping an eye out for special offers though. The outdoor images are from the hotel group's press department so, no, it wasn't as sunny as that but it was warm – a very pleasant 18 or 19 degrees. I thought you would smile at the 'own room' and free WiFi bit, which I wrote before I read your current post! …and you were absolutely right! It really was a super weekend – very relaxing, just the three of us, time to chat and not that far from home so journey unstressful. Looks absolutely fabulous. I visit Ickworth regularly but have never explored the hotel. It looks so imposing and grand, you wouldn't think it was so geared towards families. The younger children we saw there were having a ball. You should have a nosey in the hotel next time you visit, see what you think. Your children would have loved it but even a 17 year old had fun- he played table tennis with his dad after dinner each night while I sat on a beanbag watching!! It was quite stunning. There were groups there with small babies up to grandparents: definitely a welcoming place for all members of the family. I can imagine if you visited with other families, The Lodge would be a brilliant place to book together. I've always wondered what staying at a National Trust would be like … I guess this is one with frills on! Looks amazing. Hello Philippa. It felt pretty cool to be staying at a National Trust property. We had a special pass to show at the entrance gate to say we were residents – I quite liked being waved through. And when the day visitors have gone home you have to place to yourselves. It would be great at Christmas – I can just imagine going for long walks in the park, all wrapped up, then heading back to the log fire to warm up. We have had some great days out at National Trust properties but this was the first time we had stayed in one – very special. You're right – it's just like Pemberley! I can imagine you in your bonnet and empire line frock, taking the air! It did feel rather grand when we first arrived but it was so relaxed and friendly, we felft very much at home. What a magnificent building, it would be impossible not to enjoy it and I'm in love with the bed set, beautiful. It seems more and more hotels are realising that luxury and children can go hand in hand. We made Dougie feel really sorry he'd missed them – kept going on and on about them! Looks amazing, Free wifi and spa treatment too. Free WiFi makes all the difference. Not that we are glued to our phones etc but so handy to have the facility. Other bigger hotel chains should take note. I had a facial when I was there – great products and hot towels – very soothing. If it's near, you should have a look. Ickworth itself is a super place: the National Trust team do a great job. I suppose we all have to slum it sometimes 😉 Splendid! It was over too quickly but, funnily enough, just two nights was enough to feel we had experienced a real break away from things. Oh lala! I am so so jealous – this looks amazing. Wish they had these posh family hotels when we were living there. We did go to a few like Fowey Hall (Toad Hall in the book) and it was stunning. I think it's such a good idea to turn these grand homes into hotels – even just one wing, like this one. Have never been to Fowey Hall – must take a look.